Know someone looking to sell or rent their property? Ringabell.property allows you to earn money by informing estate agents about properties for sale or for rent in your local area, under complete confidentiality. 30 seconds to create an alert! Our application is available for iOS and Android phones. For this we develop our hand in hand with you service and our partner agencies. All information provided to us is strictly confidential and will never be published or disclosed to any third party. 30 seconds is all it takes to enter all the necessary information. Upon signature of the first listing agreement, you receive £100, credited directly to your bank account. 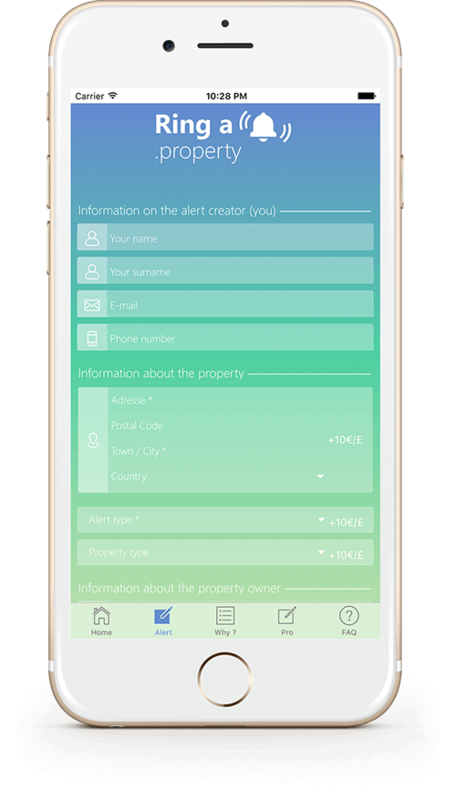 As soon as you know of a property for sale or for rent, you can create an alert, by providing some information about the property and the property owner. If your alert results in the signature of a listing agreement by one of our partner real estate agencies or letting agencies, we'll pay you €100 (or £100 for users in the in the UK). If the property goes on to be sold/rented by our partner agency thanks to your alert, we'll give you an additional 5% of the commission fee charged on the transaction. What's a listing agreement ? A listing agreement is the contract between the property owner and the real estate agency, instructing the agency to sell/rent the owner's property on their behalf. When a listing agreement is signed thanks to an alert you create on Ringabell.property, we pay €100/£100 directly into your bank account. You earn : Up to €100/£100 if all of the information in the alert is entered correctly (to facilitate the work of our partner agencies), on signature of a listing agreement with one (or more) of these agencies. 5% of the commission charged by the partner agency that completes the sale/rent of the property. For example, if you create an alert for an apartment that goes on to be sold for €450,000, your estimated total earnings amount to €550. No. Your earnings are propertional to the value of the property, and are therefore unlimited. If, for example you create an alert for a property that sells for €5 million, the partner agency will earn around €100,000, with €5,000 of that fee going directly to you (5 % of €100,000). The more alerts you create, the more money you can earn!